Thank you for considering our family's 'Home Away From Home'! Our Villa is a desirable 4th floor 'Direct Oceanfront' end unit 423 in the popular Forest Beach area. A major renovation included removing walls, installation of new wood cabinetry in the kitchen, dining area and bathrooms, granite countertops, new stainless steel appliances ,a walkin shower in the master bath and 2nd bedroom, overhead LED lighting, ceiling fans, wood floors and more. The result is a very open, airy, and beachy atmosphere. Our many return guests love the new look! There are 2 bedrooms, each of which has its own private bathroom. There is a large balcony off the living/dining area, and a smaller one off the master bedroom, perfect for enjoying meals and observing the manicured grounds, the pool, the beach, and the ever-changing Atlantic Ocean. Watch for dolphins playing close to shore, shrimp boats catching your next meal, and ships on the horizon heading for the Port of Savannah or the open sea. Coligny Plaza, with it's many shops and restaurants, is in walking distance. There is a paved walking and bike trail across the street from our complex. And if the mood strikes you to venture further out from your 'Home Away From Home', take a day trip to historic Buford, Savannah, or Charleston. Won't you join us! This villa is nonsmoking, no pets are allowed, we have local Caretakers to respond quickly to any concerns you may have. The address for our villa is 11 South Forest Beach Drive, there is secured parking. Our villa is approximately 1300 square feet. Please check our rate and availability calendar. Rates include linens, towels, and departure cleaning. 10% South Carolina tax is additional. Loved the location amenities, and everything else. Owner is great to work with too. This place was awesome for our mother, daughter and granddaughter get away. We thoroughly enjoyed our stay at this condo and it was perfect for all of our needs. We loved sitting on the balcony and listening to the water in the evenings and it was nice to be able to see the pool, too. It had everything we needed inside and more. The cooler came in handy to pack our waters for the pool/beach and the beach chairs and noodles were an added bonus! We will definitely look into staying at this condo in the future if we ever get back to Hilton Head! Elke was awesome to work with too! Glad to hear you had a wonderful mother, daughter, grandmother get-a-way. I would love to rent to you again in the future. Unit was comfortable, kitchen was well equipped and great view of the Ocean ! Thank you. I would love to have you back on your next visit. This condo is like home away from home! You are always welcome in our unit. 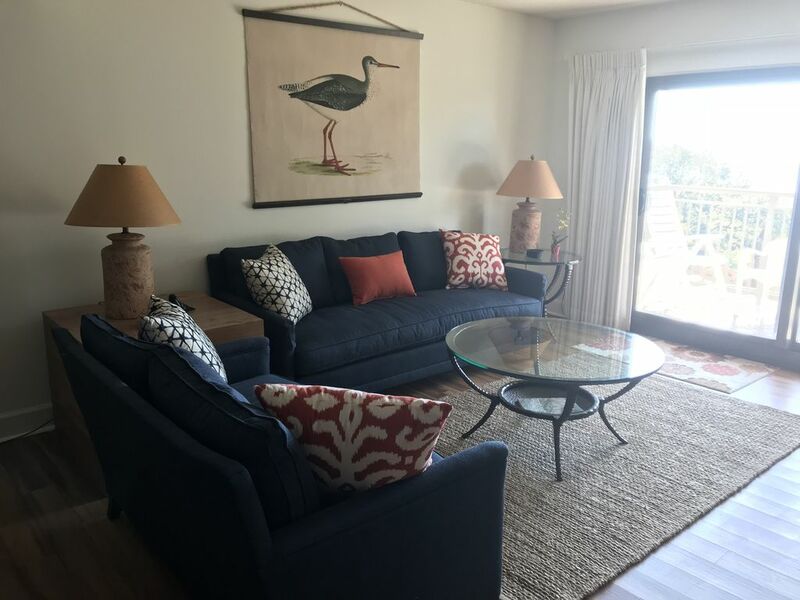 We enjoy renting to guests like you....Hope you are able to come back for many years to come..
Great open floor plan with beautiful ocean front and pool view! My best friend and I had a great fall getaway at this beautiful condo. We enjoyed being on the 4th floor because we could eat breakfast on the large balcony overlooking the ocean and the pool. Gorgeous landscaping and shading from nearby trees.We loved the layout of the condo with the open floor plan. The beds were very comfortable and we each had a private bathroom. Well equipped kitchen. We liked the gated entrance to the complex with a security guard. Also the beach access had a gate that required a code for entrance which made us feel more secure. Within walking distance is Coligny Plaza with many shopping and eating choices. The owner called and checked on us several times to make sure our stay was just what we wanted! Very personable and nice. We will definitely be back! Thanks for being such wonderful guests. I am happy that we were able to accommodate you for another week to make up for the days you missed having to evacuate during the Hurricane week. Awesome Condo, Awesome location, wonderful Host ! Took a family vacation before the kids went back to College, the condo was perfect with awesome views. If your looking for walking distance to dining and entertainment this is perfect! Nightly walks to Coligny Plaza for ice cream or a wine slushie. Condo is fully equipped and beds were comfy. This unit is well worth the stay. Thanks, Darla. I am happy to hear that you enjoyed our unit. I would love for you to be able to come back and stay in our "Home Away from Home".